AV Club: Akira Kurosawa's masterful crime thriller High And Low is a tale of two movies: The first is a 53-minute potboiler set almost entirely in a single room, and the second a high-stakes police procedural that zigzags breathlessly from one lead to the next as it tightens the net on a suspected kidnapper. One of the remarkable things about the movie is how those halves interact, as the suffocating tension of confinement gives way to the open air. There's a different kind of suspense in each situation, with the first half consumed in extended negotiation and plotting over the kidnapping, and the second half a race against the clock to hunt down the sociopath responsible. Through it all, Kurosawa analyzes the smallest possible details in laying out and cracking the case; in that sense, High And Low is like a proto-Zodiac in its obsessive tracking of every lead, no matter how obscure or unpromising. NYTimes: Using, of all things, Ed McBain's strictly American novel, "King's Ransom," as a source, Mr. Kurosawa and two co-scenarists have transferred the kidnaping yarn from Manhattan to Yokohama, using a fine cast headed by the famous Toshiro Mifune. The result is a sizzling, artistic crackerjack and a model of its genre, pegged on a harassed man's moral decision, laced with firm characterizations and tingling detail and finally attaining an incredibly colorful crescendo of microscopic police sleuthing. Crime, believe us, doesn't pay in Yokohama—not in the end. Senses of Cinema: The film is bifurcated by an action sequence on a train. Fast editing, close-ups, noise and music now abound. There is a new, frenetic quality present. Amazingly, this four-minute sequence not only takes place in real-time, but was also filmed that way. Every passenger on the train is an extra, and Kurosawa had six camera operators scrambling after the cast. It is at this point we descend into the low; the scummy backstreets of Yokohama. The stolid investigative ability of the police takes them all over the city in pursuit of the “maniac”. Aside from the muddied, dirty background, we are supremely aware of the heat. Every shirt is plastered to its wearer’s chest, fans abound and the number of people on screen – already large – blooms to encompass shots of 20 or more, all expertly – beautifully – positioned. This heat can be read as a Hellish characteristic, and also a motif for the descent of society. This was a strong theme in Kurosawa’s work; the arbitrary, oft-times cruel world and how a man could retain humanity in that. The binary of Gondo and Takeuchi, the kidnapper, makes this clear. Ostensibly, they are both from the same, impoverished background, but where Gondo has worked hard, made ethical, strong choices and become a success, Takeuchi is a bitter failure. Slant: If High and Low teaches us anything it's how quickly the tone and perspective of a great story can shift. Kurosawa turns point of view into a boomerang, jumping back and forth between multiple characters depending on the narrative trajectory. After an opening credits sequence where the cityscape of Yokohama is completely flattened by a telephoto lens, Kurosawa immediately thrusts the viewer into the first of many verbal sparring matches. This initial 45-minute sequence takes place entirely in the posh hillside home of Gondo, the factory manager of a behemoth shoe company called National Shoes, as he experiences a drastic tonal shift firsthand. Surrounded by three corporate thugs looking to institute a hostile takeover of their company, Gondo listens carefully as these vipers spit greed and deception. Instead of wilting, Gondo throws the group out, stunning his traditional wife Reiko (Kyôko Kagawa) and loyal secretary Kawanishi (Tatsuya Mihashi). From here, a series of calls begins a thrilling roller-coaster ride that won't stop until the credits roll. After speaking with a mysterious person on the phone, Gondo confesses he plans to buy the company himself, having secretly acquired stock over the last few years. It's a rare moment of levity for Gondo in High and Low, and it passes almost immediately. Another ringing phone changes everything, bringing devastating news that his chauffeur's son has been kidnapped, snatched because he was mistaken for Gondo's own boy. An obscene ransom is demanded, and Gondo must decide whether to pay the large sum and save the child, or refuse and avoid financial ruin. The moral dilemma is simple on the surface, but Kurosawa examines every pressure-packed detail of Gondo's decision-making process. WaPo: As Gondo grapples with his choice, the movie acquires a mythic depth -- it's not unlike the story of Abraham, as Gondo is forced to decide between the life of an innocent and fealty to an abstract code. And at the same time, without ostentation, Kurosawa alludes to the more general dilemma of modern Japanese life -- the conflict between humane values and the rigid loyalties that have made for its commercial success. "High and Low" is, in a way, the companion piece to "Throne of Blood" -- it's "Macbeth," if Macbeth had married better. The movie shares the rigors of Shakespeare's construction, the symbolic and historical sweep, the pacing that makes the story expand organically in the mind. Reverse Shot: High and Low (1963) is a particularly emphatic example of Kurosawa’s attention to spatial continuity over the course of an entire film. The title announces one spatial organization, the vertical juxtaposition of prosperous legality—symbolized by the hilltop estate of shoe executive Kingo Gondo (Toshiro Mifune)—and the miasmic squalor and slinking resentment of the urban lower depths. But the very look of the film tells a different story. 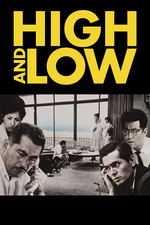 High and Low was shot using the TohoScope process, drastically widening the frame for an aspect ratio of 2.35:1. However much the social and moral themes of the film are posed along the vertical axis—in Japanese, the title is Tengoku to jigoku, “Heaven and Hell”—the images and compositions are constrained to the horizontal. Ultimately, Kurosawa is attempting to undo the vertical binary of postwar Japanese society. This “leveling,” however, is not as simple as filming in wide screen. Rather, the visual theme of the film culminates in its hard-won conclusion. In the last scene, Kurosawa arrives at a very different leveling of social space than that imagined by the diseased resentment of his villain. The dimensions of story and image converge in the film’s exceptional application of the cartographic principle. Almost every moment of High and Low turns upon continuity of vision, or the question of what can be seen from where. When the police arrive at Gondo’s house, to investigate the kidnapping of his chauffeur’s son, who has been taken instead of Gondo’s by mistake (Gondo is held responsible for the ransom anyways), the first instruction by Inspector Takura (Tatsuya Nakadai) is to close the curtains: “This room is fully visible to the kidnapper. With a telescope, he could even see us from the streets below.” Gondo’s living room has floor-to-ceiling windows that afford a panoramic overview of Yokohama sprawling below. It is the perspective of a master—just the sort of strategic position that would be seized as an impregnable redoubt by a feudal warlord in one of Kurosawa’s martial jidai-geki. But suddenly we realize that one can also see in through these windows, transforming the grand view into a vulnerability. Hey, that's me in Senses of Cinema! Ha ha! A great movie, I stand by everything I said eleven years ago! Kurosawa is such a treat. Some people don't like it, but I really love the careful, even artificial framing and composition that characterises many earlier Japanese films. Ha, love that the first comment on the "High and Low" thread is by someone called "smoke"! I watched this in college for a film class and it was probably my favorite film all quarter. It's an artistic triumph with so much to think about, but it's also just a fun movie to watch on a Saturday night. The editing in this film is bananas. You have sections that could be a minimalist stage play and then sections that strain what was possible given the era's technology. It's great. I love that it starts out so restrained, especially, because it gives Mifune room to sort of deliberately digest that character with great relish. I think this is Kurosawa's best picture. The Seven Samurai comes close and will always be my favorite for sentimental reasons, but I thing High and Low is better crafted.